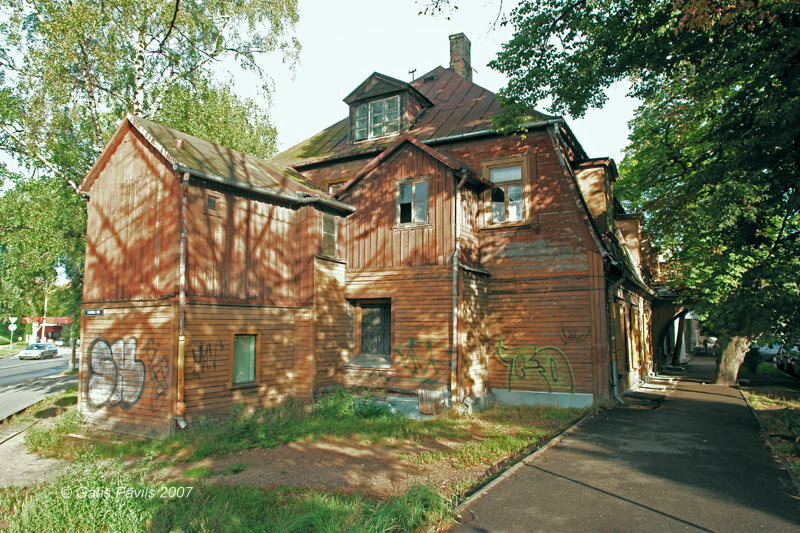 Year of construction: End of 18th c. - beginning of 19th c.
Surprisingly close to Old Riga there has survived one-floor wooden manor house built at the end of 18th century - beginning of 19th century. It belonged to Russian merchants Popovs - this is testified also by the metal monogram still located in the window of overhead lighting. In the plan from 1769 in this site there has been depicted a group of manor houses surrounded by causeways, French gardens and vegetable gardens. This shows that here were located several such buildings - but only one has survived up to this day. 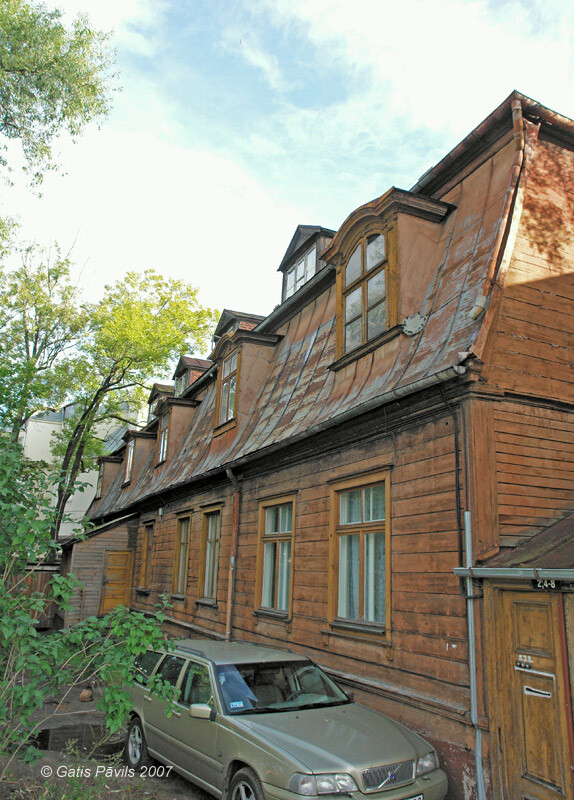 At the end of 19th century or beginning of 20th century the building has been planked thus covering the even facade. The building has been constructed of horizontal beams. It has got high French roof and high base floor with cellar in it. Apartments are located in French roof. The image of the building is defined by expressive windows shaped in styles from different periods. The building has been shaped in late Barocco style, part of windows, portals and lucarnes have got features of Neo-Classicism style. Forgings and edgings of inside doors have got features of Rococo. Specific feature of the building is a cover above the entrance door. It covers whole width of pavement and most likely it allowed to enter the house directly from the carriage, with dry feet. Facade of Popov manor, 1824. 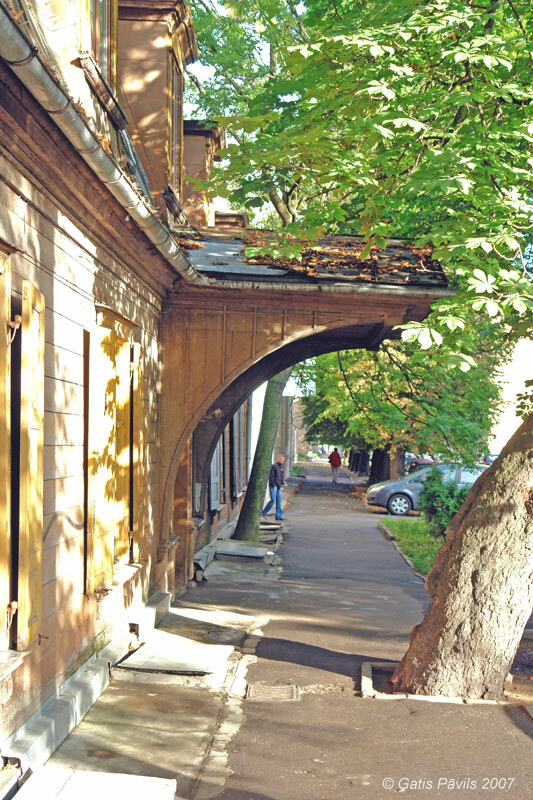 Entrance in Popov manor. 2007.08.07. Popov manor, inner yard. 2007.08.07. Koka Rīga, Rīga, Neputns, 2001, 49, 201, 220, 229-230, 233.p. Kaupuža D. Rīgas muižiņas. Latvijas architektūra, Rīga, 2005, 95.p. Latvijas piļu un muižu asociācijas mājaslapa, visited in 12 June 2009.